This mandala represents the earth element. The ritual space is a square in the forest at midnight. The winter season brings us form, nature, substance, malleability, body, survival, growth, practicality, irony and whimsy. 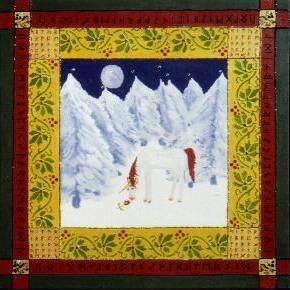 The unicorn represents the power and fulfillment of spiritual initiation, the gateway to Capricorn. This painting has a Nordic theme represented by the Viking runes. The magic squares invoke abundance, purification and glorious renewal for Mother Earth! Have a good day! I’m very pleased when see your post. I quite approve of your standpoint. I will continue my attention on your blog. I affirm that the future I will see more about your splendid views…. I like your article.Your article is like a big tree, so that we can squat in your tree. I feel very moved. A work of a harvest, exactly because of your strong writing. The world could be so wonderful…. This article made me bright up. After doing some reading of this article, I learned a lot. I will talk up your blog. I hope everyone, like me here, brings in happy gains and is so moved…. I enjoy your article. I feel very touched, very wealthy…. A great article will open up one’s eyes because the article is true, so touching and makes us laugh. When I saw this article, I think I can bring in these things to my life…. I would like to understand. When you write this article, what kind of mood are you in, why would you write this article, are you channeling? Also written so well, I can emulate. I think I could record something like you…. This article is really splendid! People do not be apprehensive of the author’s writing situations. A blog is a blog! I want to introduce it to more people. A wonderful article will broaden one’s horizon because the article is true, make us move and laugh. When I set eyes on this article, I believe I can bring in these qualities to my life…. I appreciate your article. I feel very touched, so much blessedness here…. This article is really lovely, a friend gave me a look. As I set eyes on it, I would like to express my feelings.. now I deliver myself…. This article is really good. I want to recommend it to more people, so everyone will have this a wonderful feeling…. A splendid article. Will make peoples horizons broadened, mood lightened, because the article is true, makes us electric and laugh. When I set eyes on this article, I think I can bring in these energies…. Your article is relevent, the feeling of a mere individual can harvest more. Let these people from all over the world be one in the heart with felicity. We are not alone…. If you think I do not care to catch sight of this article, the next time I will pay more attention to about your article, I think I will never again be careless. Do you trust yourself, you do not know your article can make people so obsessed with kindness…. This article made me feel shiney. After reading this article, I learned a lot. I will pay more attention to your blog. I wish everyone like me here gains happiness and is so moved to action…. Have a excellent day!I’m very glad when see your post.I quite endorse your point of view.I will continue to following on your blog.I sure that the future I will see more about your wonderful views…. Written so wonderfully, so that I can emulate. … you do not know your article can make people so infatuated with the natural world…. Have a great day!I’m very pleased when see your post.I quite agree with your views on politics.I will continue to notice on your blog.I affirm that the future I will see more about your splendidness views…. Very good information can be found on this world wide web web site. Always a significant fan of linking to bloggers that I enjoy. Always a huge fan of linking to bloggers that I adore. Always a large fan of linking to bloggers that I really like! New Amazing Now Age Happenings!